Every Ipswich Town Supporter loves to see home grown players playing in the first team. Please see the information on how they get there and how you can help. At Ipswich Town we continue to develop our own players through the Academy, on to professional contracts and into the First Team. The route for our home grown players has a proven track record of success over many years. We will continually strive to create the best environment, welfare, facilities, and coaches to ensure that every Academy Schoolboy has the chance to develop their skills while they are in our system. In this website there are many examples of what the Academy focuses on and how many very successful graduates we have produced. We currently have over 140 players and 10 Teams within the Academy from U9s to U23s, all are based at the training ground on Playford Rd. As well as their day to day training all Academy Schoolboys & Scholars have to take part in Educational lessons. The weekly lessons form part of their all round development and outside tutors are employed to deliver the topics to the players. We now have over 100 local companies and individuals who support the Academy financially every season. With their support we are able to maintain and improve the facilities and equipment at the Academy and help produce the ITFC players of the future. Every company that enters into an Academy Sponsorship package can feel proud of the successes for the Academy as they have all played their part. Packages are available from just £500 plus vat per season and this will include promotion for the company as well as hospitality and Director’s Box Tickets at Portman Rd for a first team game. In 2016 we installed a brand new 3G artificial pitch at the Academy and have also relayed the indoor Dome pitch to the same standard of artificial surface. This investment at the Academy will help the coaches with their coaching sessions throughout the whole season. Investments like this made by our Owner Marcus Evans are constantly being backed up by Academy Sponsors and Academy fundraising events. The agreed benefits for all sponsors depends on the particular package they have signed up for. All packages include company branding and recognition as well as Directors Box seats and Hospitality at a First Team game at Portman Rd. Academy Sponsors are invited to the training ground for Open Days and also to watch the Academy teams in action. We are always looking for additional sponsors to join the Academy Association so if you would like to discuss any of our opportunities please get in touch using my contact details at the bottom of this page. Most of our packages are bespoke to suit the needs and budgets for any Companies and I would be delighted to show you round the Academy so you will be able to see how any new investment will be utilised. Please join the Academy Association and be part in the future of Ipswich Town Football Club through its Youth Academy. •	Company branding in the Ipswich Town matchday programme for the season, the Academy website, and the Academy sponsors boards at the training ground and at Portman Road. •	Two hospitality places at an Ipswich Town first-team game at Portman Road in the Sir Bobby Robson Suite with car parking. •	Two directors box seats at two Ipswich Town first-team games at Portman Road entrance to the Champions Lounge* with car parking. •	Four seats in a shared executive Cobbold Box for an Ipswich Town first-team game at Portman Road with car parking. •	An invitation to attend Academy matches at Portman Road. •	Academy Association gifts (silicone band, pin badge & car sticker) and will receive monthly Academy updates via email. 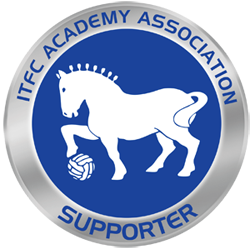 •	Use of our ITFC Academy Association supporter logo for display on publications/company letterhead/website etc. Ramsey Package members will be guaranteed two Play-Off home semi-final & final tickets, should Ipswich qualify. Tickets will be charged at normal prices. •	Two directors box seats at two Ipswich Town first-team games at Portman Road with entrance to the Champions Lounge* and car parking. •	Use of our ITFC Academy Association supporter logo for display on publications/company letterhead/ website etc. Robson Package members will be guaranteed two Play-Off Final tickets should Ipswich qualify, tickets will be charged at normal prices. * The Champions Lounge is available to ITFC Directors guests, Academy sponsors and corporate clients pre-match, at half-time and for a short period post match. Tea and coffee is served at half-time. Other food and drinks are available to purchase. LEGENDS OF DARTS – ITFC PLAYERS CONFIRMED! ITFC LEGENDS OF DARTS 2019 – BOOK NOW!